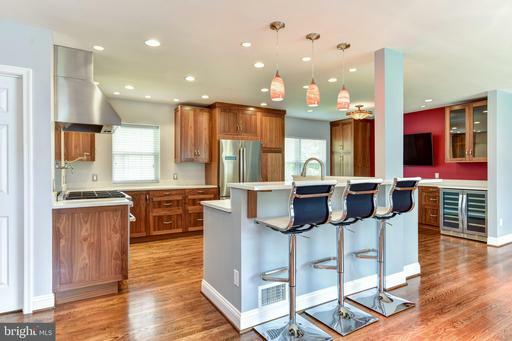 Stunning 5 bed, 4 full bath Single Family Home, Completely Renovated and Expanded. Inviting custom built portico welcomes you into this gorgeous light-filled home. 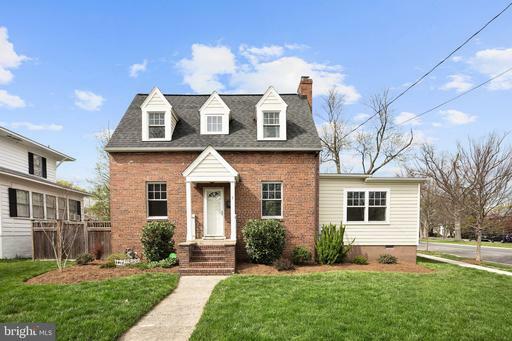 Striking new hardwood floors throughout, Beautiful kitchen featuring gleaming quartz countertops, oversized farmhouse sink, and Stainless Steel GE appliances. Convenient 2nd Story Laundry and gorgeous Master Suite with custom shower and free-standing soaking tub. All brand new 2-zone Hi-Eff HVAC system featuring 75 gallon hot water heater. All new Exterior features include new James Hardie Siding, new windows, and new Timberline Architectural roof. Ideal Alexandria City location, close to Old Town, Metro, Public Transit, Restaurants, Shopping. 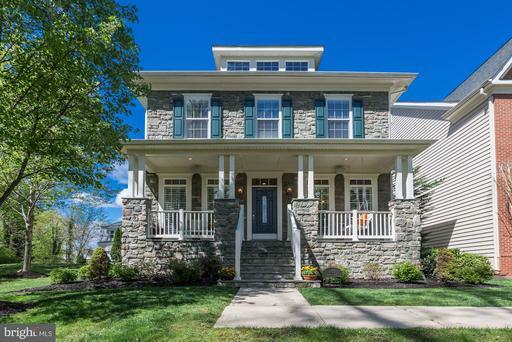 Incredible location near Braddock Metro! 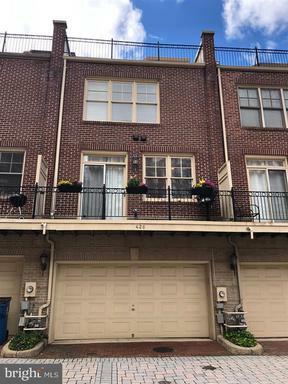 3 bedroom, 2 full bath townhome with hardwoods throughout! 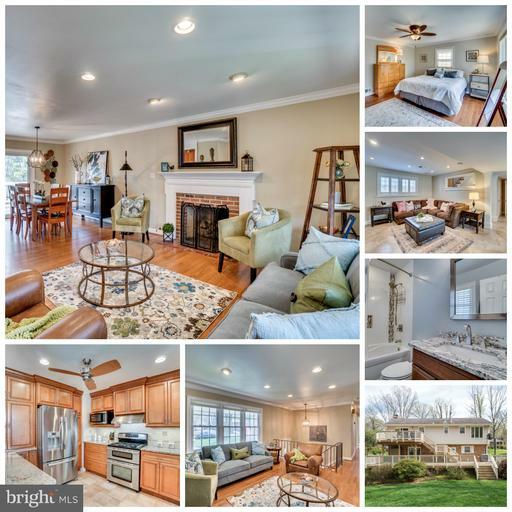 Flooded with light and a fabulous screened in front porch and fenced yard. Close to "The Avenue" with all Del Day has to offer. Full of style, this contemporary, three-level home has a terrific, open-concept layout with vaulted ceilings and a loft. The lush landscape provides a garden-like setting. With both great indoor and outdoor spaces, this home is terrific for entertaining family and friends. Located in The Pinecrest community, which is nestled on more than 35 acres and adjacent to the Pinecrest Golf Course a public golf course. The Pinecrest community itself offers trails, tennis courts, and a tot lot. 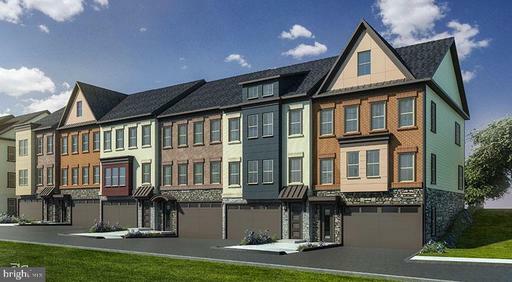 Convenient to superb amenities that make Northern Virginia an exciting place to live. Just 10 miles to DC. 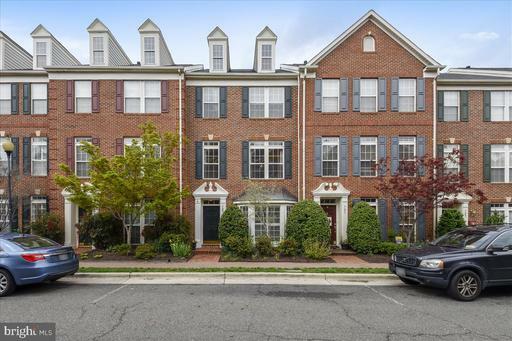 Beautifully upgraded townhome located in the heart of Kingstowne community. Popular EASTON II model with loft. The property features three bedrooms, three full and one half baths, spacious master suite with loft, two gas fireplaces. One car garage with full driveway. Spacious deck overlooking trees- privacy in the back. Owners upgrades include: new roof 2018, HVAC 2015, all new Thompson Creek windows and door, plantation shutters, stainless steel appliances, new garage door and motor 2017, hardwoods throughout, maintenance free deck, custom built ins, security system, fresh neutral paint throughout, brick patio. Both TV convey. Perfect move in condition!!! 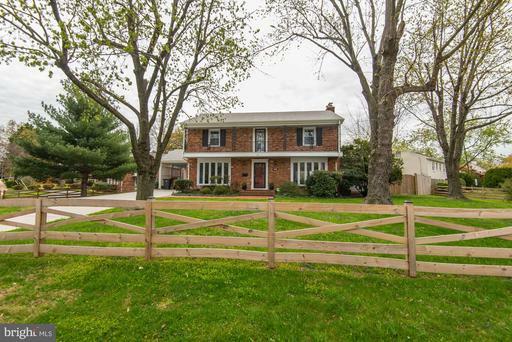 Awesome opportunity to own this nicely updated home with a huge lot .65 acres in Mount Vernon. 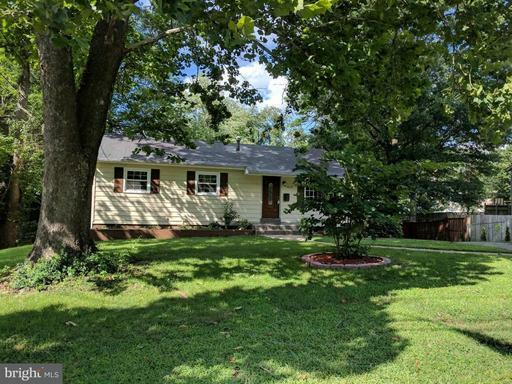 This home has upgrades youll love including a new roof in 2015, updated kitchen in 2015, new furnace in 2015, new oil tank 2019, new carpet in basement 2019, and renovated bathrooms in 2017 and 2019. Beautiful perennial gardens are getting ready to bloom. Huge two car garage with attic access for extra storage! 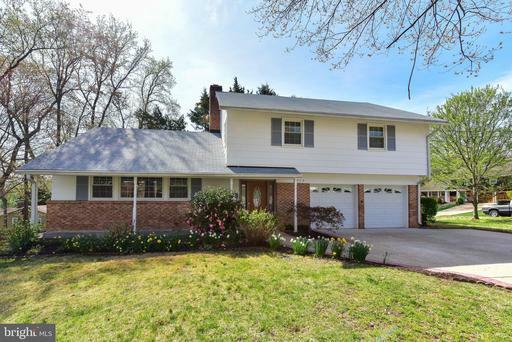 Minutes to Ft. Belvoir and the GW Parkway. Home warranty included! 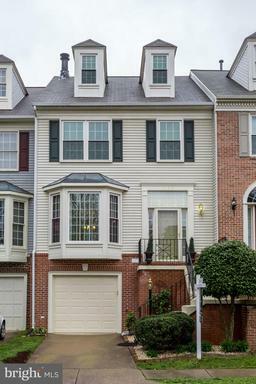 Stately end unit townhouse in the sought after Overlook Community! Main level includes gorgeous hardwoods, spacious living room, separate library, eat in kitchen, powder room, and incredible sun room with access to a private deck backing to trees! The spacious master suite has a sitting room, and stunning bathroom remodel with granite, double sink, separate tub and custom tile shower with glass door! Three total bedrooms on the upper level, nicely updated hall bathroom with granite countertops. Lower level has a large recreation room, perfect for watching the games with friends, gas fireplace, half bath, and an additional office space in the bump out. Flagstone patio in rear, spacious two car garage and concrete driveway for additional parking. 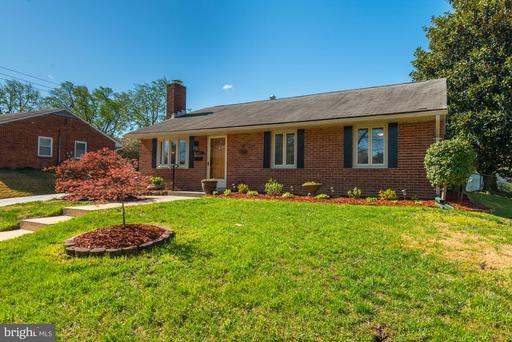 Amazing commuter location with quick access to 395/495, and just minutes from the Van Dorn Metro! This home is amazing -Better than new! New renovations include new floors in entire main level, master bedroom, master closets, main level and upstairs hallways. All new lighting throughout, including recessed lighting. Vent Hood installed, all new stainless steel appliances, back-splash, wainscoting in dining room, crown molding throughout, storage in the mudroom, vanities in master bathroom, half bath, and too many to mention. Located on a large lot .55 acres at the end of a cul de sac, there is 2 level Trex deck, underground sprinkler system and a great play area. 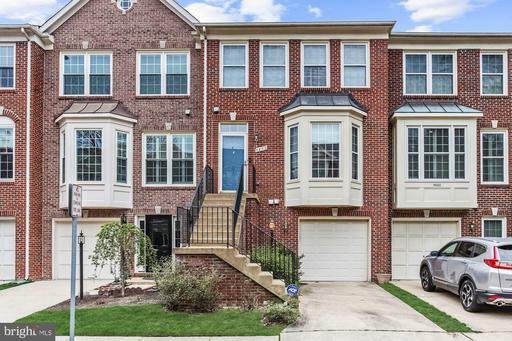 Welcome to 6373 Levtov Landing, a gorgeous brick-front townhouse in desirable Overlook that showcases an endless list of exceptional upgrades. With oversized windows, beautifully refinished hardwood floors and neutral paint tones, its ready for the most discerning eyes. 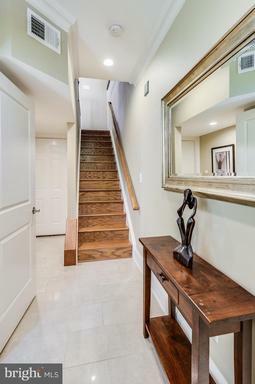 Other highlights include an updated kitchen featuring granite counters and stainless-steel appliances, redone baths with modern fixtures, a magnificent master bedroom suite, fresh paint and lighting throughout, plus a wonderful lower level rec room with a wet bar that is perfect for entertaining guests. Overlook residents can enjoy a variety of amenities including a pool, clubhouse, tennis courts, and playgrounds. It is only minutes to commuter routes I-95/395/495, Van Dorn and Eisenhower Metro Stations, Old Town Alexandria, Arlington and Washington, D.C.! Spectacular Mt. 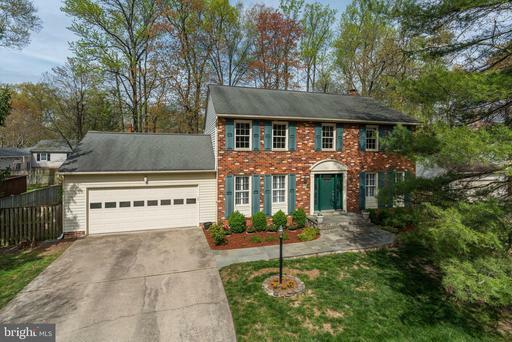 Vernon home has been completely and stunningly remodeled with contemporary features, open floor plan and high-end upgrades making this popular Colonial B model w/garage one of Riverside Estates finest homes. The kitchen is the focal point of the home. It was gutted and now opens to the living room. It features quartz counters, six burner gas range by Miele, new hardwood floors, stainless steel appliances, beautiful cabinety, and an island with a double basin farmhouse sink which opens to the living room and fireplace. Two bedrooms combined to make a large master bedroom with huge walk-in closet and beautiful bath. Finished lower level offers a 4th bedroom and 3rd full bath, along with a Rec Room with fireplace. Perfect for a Nanny or Au Pair . New roof, deck, front door and A/C in 2018. No expense was spared in creating this masterpiece. Welcome to the PAVILIONS AT HUNTINGTON. This 3 level, 4 bedrooms 3.5 baths 1842 sq. ft. the townhouse is very nicely appointed and has an oversized 2 car garage! A short distance to Huntington Metro or Minutes to I-95/395/495. Hardwoods on main! Kitchen has granite, stainless appliances gas range and cherry cabinets! Master suite features tray ceiling, soaking tub, double vanity, and separate shower stall! Fireplace that joins dining and living space! New to the Market! Cant beat this location!!! 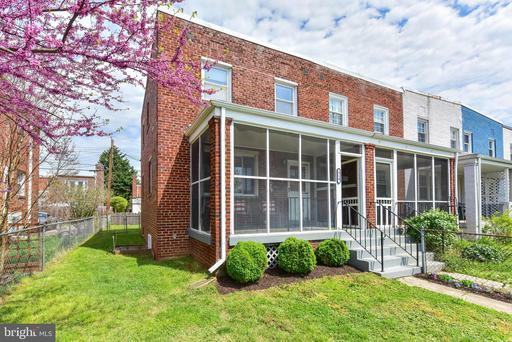 Rarely available updated Rowhouse in Hunter Creek behind Southside and Faccia Luna. Beautiful hardwoods on main level and upstairs. Formal dining room opens to living room through French doors. Tall windows in the living room for tons of natural lights. Back of the house offers gourmet kitchen, family room and gas fireplace. Family room has beautiful view through french doors to private patio. Just beyond the patio gates are 2 parking spots and a shed! Easy assess to 495, Old Town or anywhere where you need to be in Northern VA! Upstairs offers 3 spacious bedrooms with GREAT closet space. Master is so inviting with vaulted ceilings, skylights, gas fireplace huge windows and gorgeous updated master bath. Den or office on the 4th floor with tons of storage. But yet there is more storage! Head to the basement that offers builtins and laundry facilities! 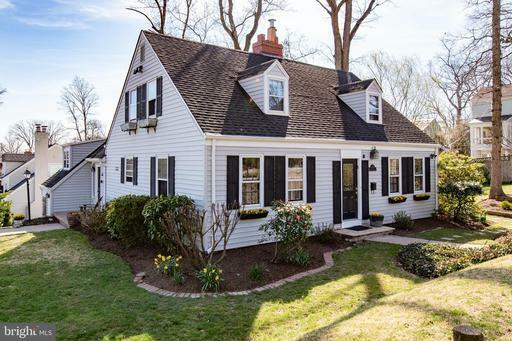 Built in 1979 this home has the feel of Old Town Alexandria but conveniences of modern day construction! Dont miss it! 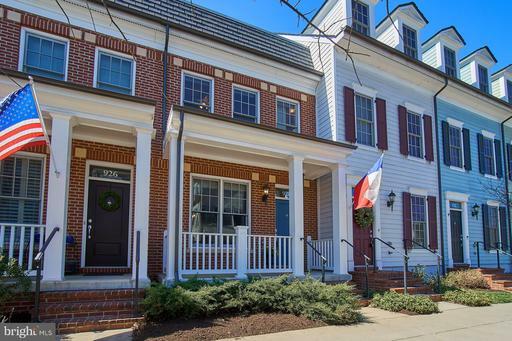 Just three blocks to King Streets dining and shopping district sits this stately three-story brick townhome, perfectly framed by its exquisitely landscaped front garden. 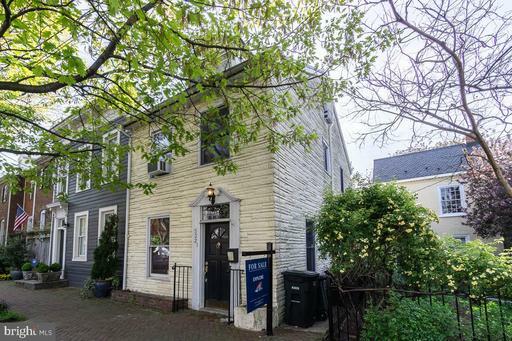 The 3 bed, 2 full and 2 half bath row house is a beautiful example of the convenience and culture of living in Old Town, coupled with the space and amenities desired for todays lifestyle. Walking into the homes open and bright main level youre struck by the incredible front-to-back views made possible by the open floor plan and wall-to-wall glass sliding panel door, which offers a view of--and easy access to--the serene garden. This level of the home features an updated kitchen complete with stainless steel appliances, gas range, subway tile backsplash, granite breakfast bar, and new tile floor. Just beyond the kitchen you will find the formal dining room, a comfortable space that can accommodate a large group. Stepping down from the homes dining room, you enter the main living space, a gracious and bright living room with a wall of custom built ins. 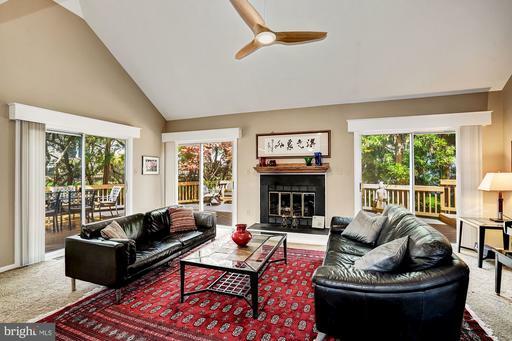 Relax in front of the gas fireplace and appreciate the views of the garden framed by a Japanese maple tree. 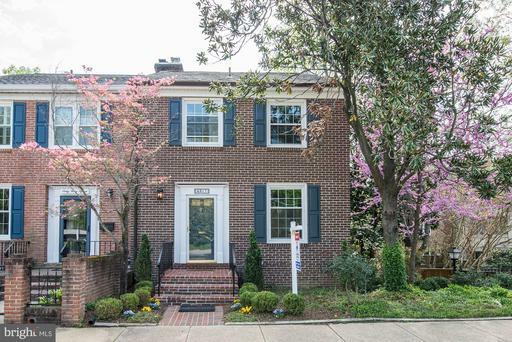 Also located on the first floor is a discreet powder room, updated with a granite-topped vanity and grass cloth wallpaper accent wall.The homes delightful brick-paved outdoor space is perfect for dining, relaxing, and entertaining. A shed provides room for additional storage, and an off-street reserved parking space is conveniently located just outside the garden gate. The second floor is home to a large master suite, complete with vaulted ceilings, a wall of closets, and a large en-suite bathroom with a jetted tub and dressing nook. A spacious second bedroom is also located on this floor, and is next to the homes second full bath. This bath is appointed with a large tile shower, built-in corner cabinet, and pedestal sink. The washer and dryer are conveniently located near the bedrooms. Ascending the staircase to the third floor, youll find sunshine streaming in through the dormer windows illuminating the high ceilings of the homes third bedroom, a flexible space currently used as a home gym and office. Here too youll find the door to the homes walk-in attic, providing convenient and ample storage, as well as the homes second half bathroom. 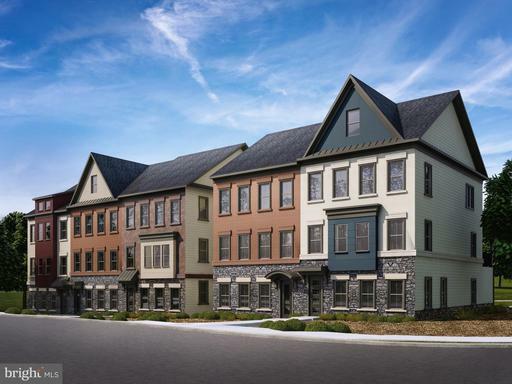 The homes Old Town location is just three blocks to King Streets shopping and dining district, as well as convenient to Whole Foods, Harris Teeter, Trader Joes, Starbucks farmers markets. 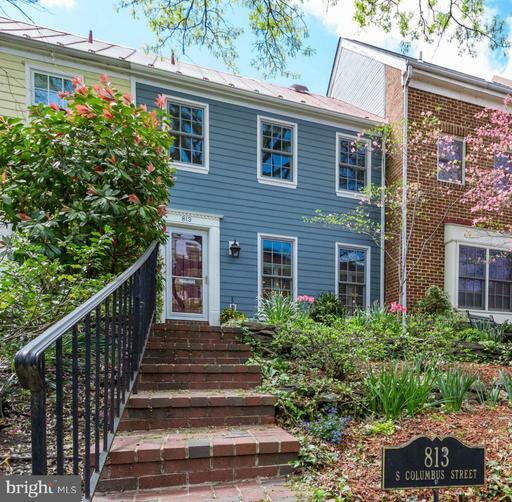 The location is a commuters dream: walking distance to King Street Metro, and easy access to I-95/495, Route 1, and the GW Parkway. LOCATION, LOCATION, LOCATION! Gorgeous home - just beautiful throughout! End unit with hardwoods on two levels, freshly painted, new cabinets with stunning granite, new ceramic kitchen floor, new lighting, new appliances, updated master bath, 2 fireplaces, replacement windows, huge back yard, rare 3 season room underneath deck adding to finished space, huge family room, etc. Parking in front of unit. This home is part of a civic association, not a homeowners association. Wide foyer invites you to kick off your shoes, before leading you up to gleaming wood floors underfoot, and the ultimate open floor plan bathed in natural sunlight. Little details like arched doorways, ceiling medallions for elegant lighting, and scripted crown moldings hint that you are home to something special. Soaring ceilings and an entire wall of arched windows framing the wood-burning fireplace are your scenery through a new pass-through in the heart of the home. Everyone can watch and listen while you prepare meals in the gourmet kitchen with rare white fantasy granite that will delight any baker or chef. Up one level are two bedrooms and a bath, and up another level and a half is a Master Suite you will never want to leave. Finished lower level is bright and sunny but cool, walking right out to a perfectly shaded brick patio under the deck. Or maybe you just want to sit in front of the second wood-burning fireplace this Fall while reading a good book. 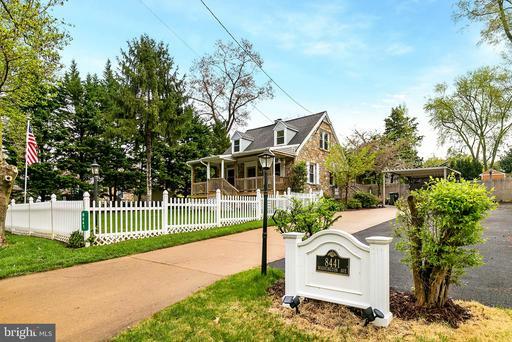 Situated on a premium lot decorated with a flowering cherry tree and landscaping in front, and an oversized back deck for sipping coffee or enjoying evening conversations over dinner with friends, among the trees. Meet up with your neighbors at one of Kingstownes two pools, or walk a few feet over to the playground community playground. 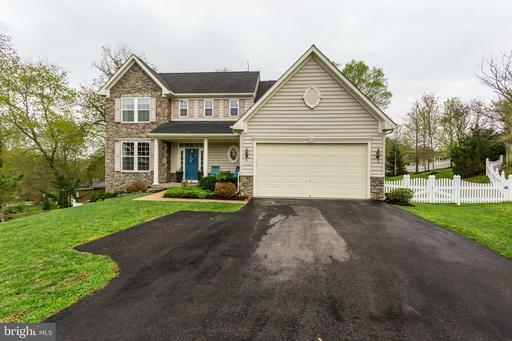 There is even a walking path behind this home which leads you to a beautiful lake, or a little further to the Kingstowne Town Center. 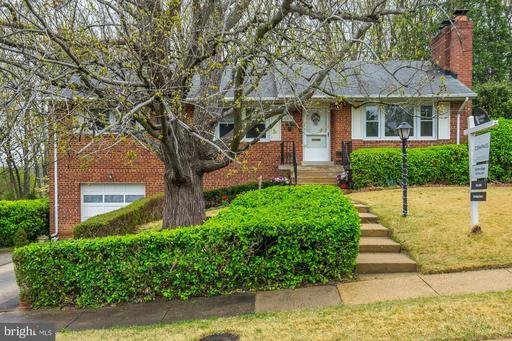 Single Family, brick Rambler on over a quarter acre lot in Parklawn! Beautiful hardwood floors throughout. Kitchen features granite counter-tops, custom cabinets an over-sized pantry. Features two large Living Rooms with wood burning fireplaces in each and lots of natural lighting. Fully fenced backyard with shed. Newly paved driveway. Minutes from Barcroft Plaza with Harriet Teeter and Glory Days! 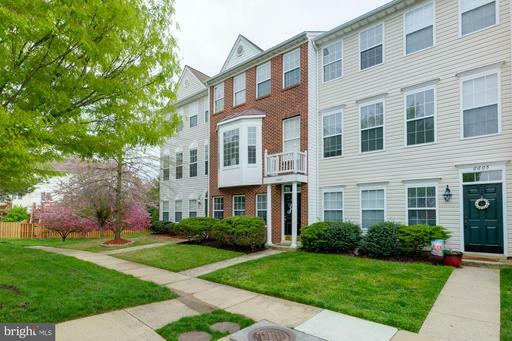 Great commuter location- inside the Beltway, close to I-495, I-395 and Columbia Pike. Wine Cheese Open House event, Thurs 4/18 @ 6-8pm! * Open House, Sat 4/20 @ 1-4pm! Location, location, location. 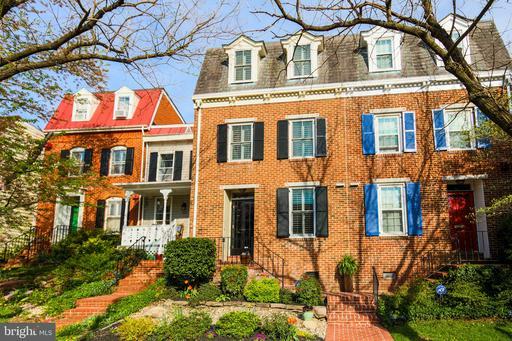 Beautiful home two blocks from King Street Metro Station in Old Town Alexandria. Can walk to almost everything: Whole Foods, Starbucks, Movie theater, OneLife Gym, and countless restaurants and shops. Excellent walk-ability and transit scores. Hardwood flooring throughout, granite in gourmet kitchen and all bathrooms. Each bedroom has private bath. 2 car garage. 2 patios ~ one off of kitchen with gas grill. Built in wall bed and cabinets in 1st floor bedroom. Gas fireplace in living room. Improvements: new dual zone HVAC with NEST controls, new water heater, new 4th floor terrace deck, and LED lights throughout.HOA fee includes swimming pool, landscaping, snow removal, trash and recycling. 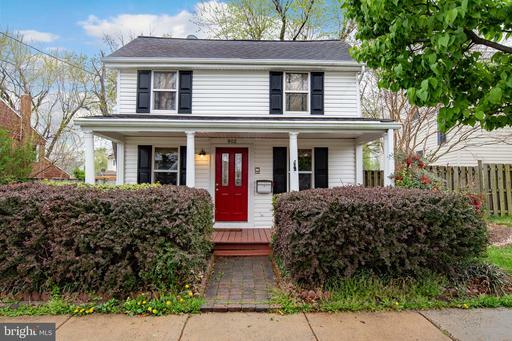 Location, Location!Convenient to old town Alexandria, Crystal City, Washington DC, located between Van Dorn and Huntington Metros, Kingstowne, and Springfield Town Center. 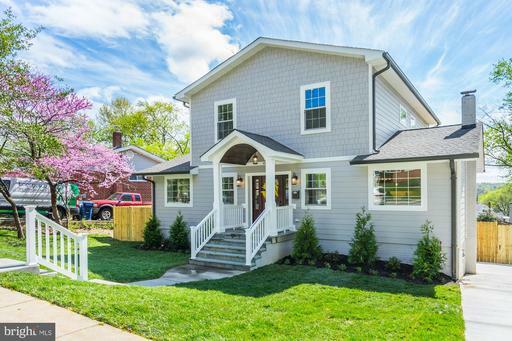 This is a beautifully renovated, sunny, LARGE 3,400 sqft 4/3.New Roof, New hardwood flooring, windows, carpets, AC, granite counter top, SS appliances, remodeled bathrooms, Brand new roof! 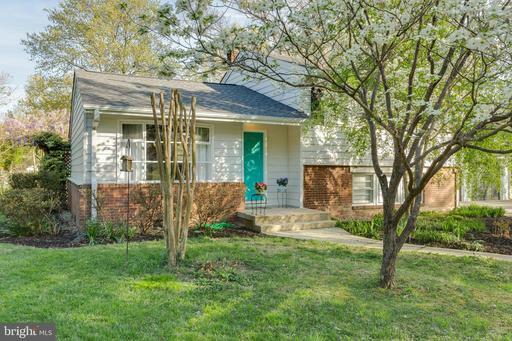 Features two decks, basketball court, patio,rec room, extra long driveway: RV/Boat, extra room, etc.Listing courtesy of Fairfax Realty Select. Looking for something extra special? Commute a critical issue? Constantly on the move between the Pentagon, Ft. Belvoir, Quantico, Andrews, commercial airports? Want generous sized rooms, high ceilings, tons of windows, lots of hardwood flooring? Fabulous master suite with updated master bath, vanity/dressing area, large walk-in closet and a fireplace with gas logs? Three, that~s right, three fireplaces all with gas logs. 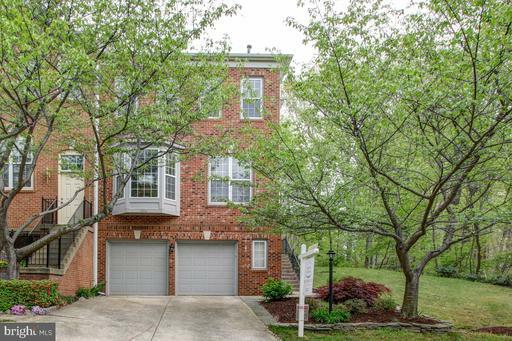 This delightful four level townhome is for you. Just off I395 near the Mixing Bowl creates lots of commuting flexibility to go north, south or around the Beltway with ease. Four finished levels with two master suites plus entire bonus level suite!!! Sizeable recreation room wet bar, fireplace with media and entertainment areas. Gas heat, hot water and cooking. Fantastic location and condition! Welcome to a TROPICAL OASIS which includes a huge in-ground swimming pool with diving board, HOT TUB under lights, Tiki Bar and BBQ. Includes custom pool house / cabana with air conditioning perfect for entertaining. Enjoy your morning coffee on the over-sized front porch and enjoy evening margaritas in your private back yard paradise. Fully fenced yard and large custom driveway on quiet street. The perfect Mt. Vernon Cape on lush green 1/2 acre. A daily getaway! Stone front part of the original Washington properties. 2 Bedrooms up and large Rec Rm on Lower Level could be 3rd BR, separate Dining Room, Updated Kitchen with Granite Counters and center island. 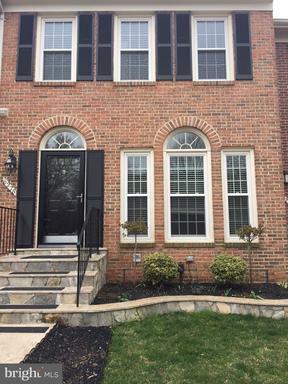 Fireplace, New Windows, Doors, and Flooring just minutes to Amazon HQ2, Old Town, National Harbor, Metro, Costco, shopping and restaurants. 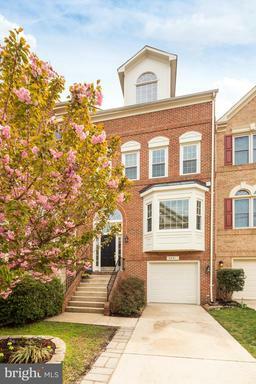 Beautiful 3 bedroom, 3.5 bathroom brick-front townhome in Franconia Forest. The main level features a spacious living room that opens to a separate dining room. Just off the dining room, you have a large kitchen complete with granite countertops, a stylish backsplash, and a breakfast area. Also included on the main level is a half bath. The upper floor level includes three bedrooms, a full bathroom, and a master suite with an ensuite bathroom. 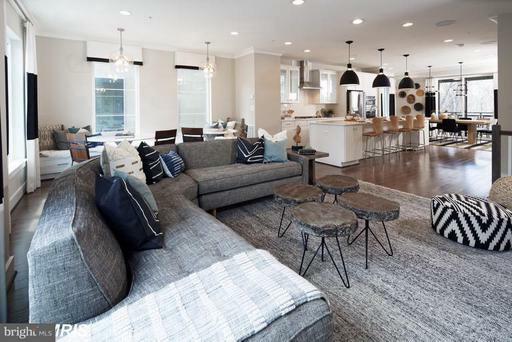 Additional highlights include a fully finished basement with a gas fireplace, Custom California closet in the master suite, and a wooden deck perfect for entertaining. Close proximity to Kingstowne shops and restaurants, public transportation bus line , Springfield Town Center, and Highway 495. Best Selling Award Winning Active Adult Floorplan in FFX CO! Genuine Stone, Hardi Brick Exteriorsw/9 Bev. Glass Front Door. Energy Star High End Inc. Features; 9 Ceilings, Fireplace, Quartz, Cabinets, Hardwood, Lg. Island, Patio More. Amazing Owners Bath. Forest Green Views. Aug/Sept Move-in. Act Now-Final Close-out. Call Lori Windsor For Appt/Incentives. Award Winning Floorplan!Act now to make interior selections. Hardi, Stone Metal Exteriors. Over-sized Rooftop Terrace, 4 levels w/2 car garage. Energy Star High End Inc. Features; 13 Kitchen island, quartz, hardwood, pend. lts., upg tile more. Act now to make selections. July-Sept Move-in. Call Lori Windsor for Appt/Incentives. Welcome to the Durham, a rare find in the beautiful CRESTLEIGH neighborhood. 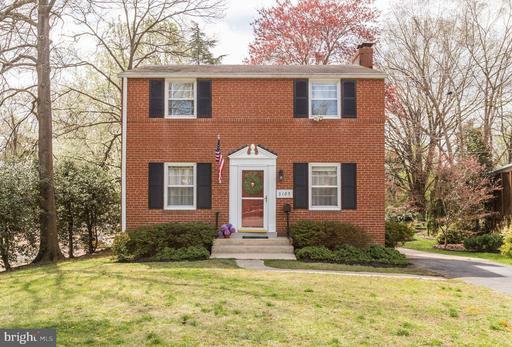 This 4 level Home is zoned for the top-rated school district in Alexandria. 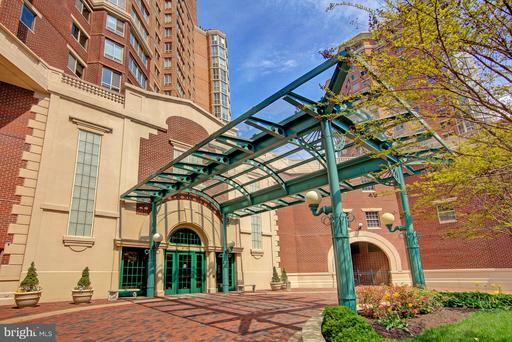 Just 2 mins from the Metro and commuter routes into downtown D.C. This elegant home is oozing with appeal. Guests are greeted to a spacious circular driveway. Ample parking in the driveway or 2 car garage. Entertaining just got exciting! Relax by the heated jacuzzi or swimming pool designed by Anthony Sylvan. The main level features a sunfilled Great room with oversized windows. Cathedrals ceilings by the fireplace. Kitchen features stainless steel appliances, granite counters , Island .With over 5000 Sqft-Its perfect for Multi-family living. The upper 2 levels boast 5 large bedrooms, 6 bedrooms NTC in the lower floor w-Full bath and walkout access. Master-bdrm w/high ceiling, laundry chute, multiple en-suite baths. Features an extra large soaking tub and shower and walk-in closets. The basement is fully finished with Bar. Rec rooms perfect for game room and Movies Energy efficient upgrades : Siding with insulation wrap, Triple pane windows, 2 zoned HVAC, 160 gal Water heater, irrigation system newer Gutter and Roof. 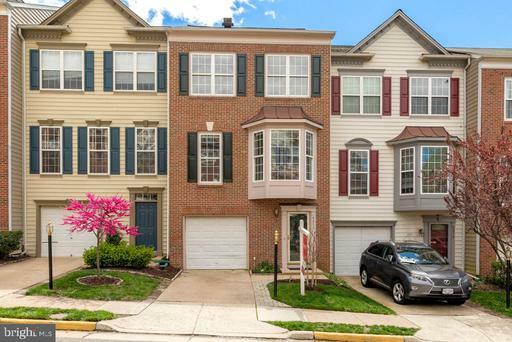 Just 5-minute drive to the Wegmans Hilltop, Springfield TownCenter, Topgolf, INOVA healthplex , Military bases -Ft Belvoir and US Coast Guard Tiscom and Metro Park. 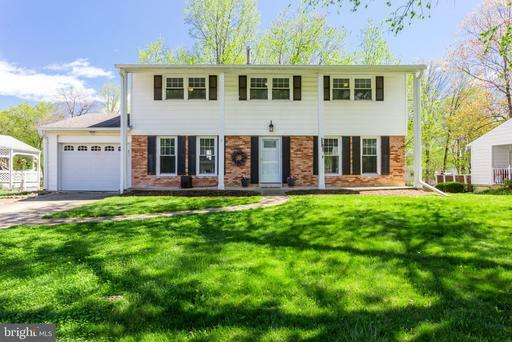 Large 4 Bedroom 2.5 bath Colonial with 2 car garage in lovely Mt. Vernon neighborhood of Riverside Estates. 3 Finished floors. Brick and siding. Front porch overhang. Wood burning fireplace in Family Room on main level off of the kitchen. Updated bathrooms. Recently replaced roof, HVAC , and hot water heater. Hardwood floors main and upper levels. Slate patio. Rec Rm aka Game Room, Media Room and office in walkout lower level. Fabulous Mt. 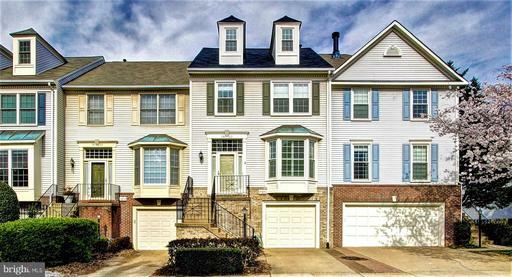 Vernon location, just 10 mins to Ft. Belvoir South 15 mins. to Old Town Alexandria north, scenic commuting on the George Washington Parkway along the Potomac River.